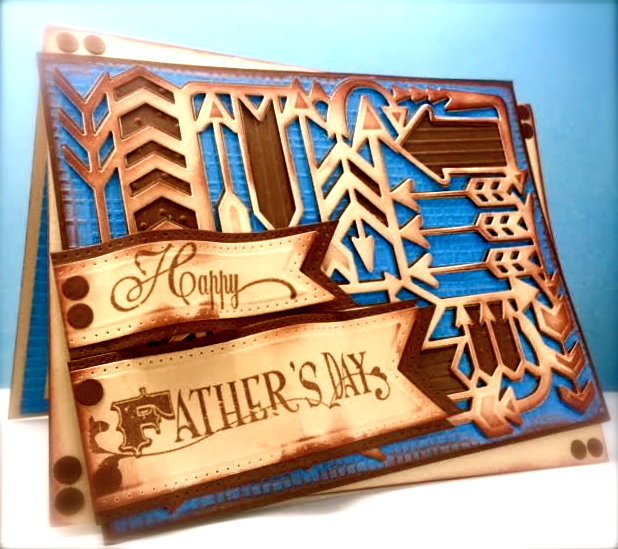 Cards by America: A Happy Father's Day! This card is in honor of YOU - to thank you for guiding us along the way in LIFE. Ink: Brilliance Coffee Bean, Stampin' Up! This fun arrows Sizzix Thinlits Card Front Die (used as background here), is awesome because it does most of the work for you. I even kept some of the arrow cuts that cut out from this die and embossed them, then replaced them in their corresponding cut areas. Ive used a hole punch for the Brown corner dots. The bottom layer is Dry Embossed for added texture and all edges are Sponged to finish the fun grungy masculine look. I LOVE THESE "Frames and Tags" Pierced Flags dies from Creative Expressions that are designed by Sue Wilson. Check out Sue's entire Collection HERE. Thanks for looking and hope you'll enjoy your day with DAD! Hi America what a great card and the die cuts and the design are wonderful. Very nice! The arrows are a great idea for a masculine card! Thank you for participating in the OSAAT "Anything Goes with Men" Challenge! Wow! This looks awesome! I haven't seen that arrow thinlits before. You used it perfectly on your card! Thanks for playing along at the Sisterhood of Snarky Stampers! I really love the colours and all the dimension on your card! Great for Father's Day. Thanks for joining the fun at the Sisterhood of Snarky Stampers! This card is fantastic!! I love it!!! Great work!!! Thank you for joining us at Sister Act Card Challenge, good luck!!! Hi America I love your name and blog I also think your card is awesome such a fantastic design thank you for choosing to enter your card into Lil Patch of Crafty Friends unfortunately we have a limit of 10 challenges so it will not be eligible for the prize draw, please feel free to enter another of your amazing creations. Great looking masculine card! Thanks for sharing with us at My Sheri Crafts! Awesome card America!! Thanks for joining the Sisterhood of Snarky Stampers for our "D is for Dudes" challenge!! This is brilliant masculine card. Love what you did with the arrow background. Blue and brown is my favorite color combo. Thank you for sharing your wonderful card with us at Stamping Sensation. Gorgeous! Thanks for playing along with Frosted Designs!!!! woahhhh this is super cool!!! Thanks for sharing this at Sentimental Sundays. Good luck! I love everything about it! Smiles. Thank you so much for joining us in our challenge at Scrapper's Delights and Good Luck! Another WOW creation America !! So glad you could play along with us at Little Claire ! !